The National Fire Protection Association estimates that each year over 500,000 pets are impacted by house fires. 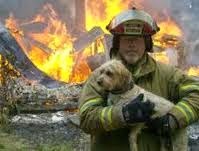 In the effort to increase awareness, July 15th has been designated National Pet Fire Safety Day. The goal is to educate pet owners to the dangers of an unexpected emergencies, such as a fire, and to help plan for the safety of their pets. Keep Pets Near Entrances - When leaving pets home alone, keep them in areas or rooms near entrances where firefighters can easily find them. Practicing Escape Routes with Pets - Keep collars and leashes at the ready in case you have to evacuate quickly with your pet or firefighters need to rescue your pet. Affix a Pet Alert Window Cling - Write down the number of pets inside your house and attach the static cling to a front window. This critical information saves rescuers time when locating your pets. Use Monitored Smoke Detection Services - As an added layer of protection beyond battery-operated smoke alarms, smoke detectors connected to a monitoring center help save pets who can't escape when left home alone.